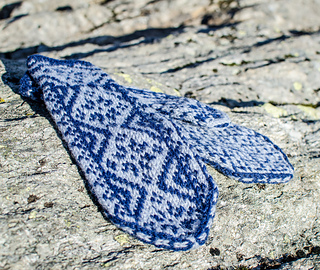 The second instalment of the Selbu Mitten club offers a slightly more intricate pattern on the back of the hand than its predecessor. Moreover, the hand is actually a bit wider than the ‘Mebonden’ and ‘Selbu’ mittens. 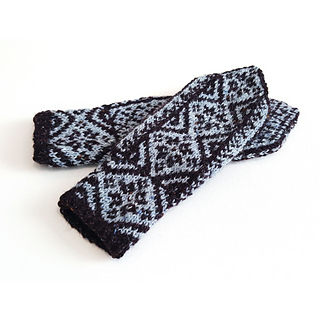 This will allow those of you with a longer row-gauge than mine to go down in needle size to make the mittens shorter, without compromising on the width. And the rest of us just get some wiggle room for our fingers. Again, you will only one 50g skein of DK weight yarn in each colour. 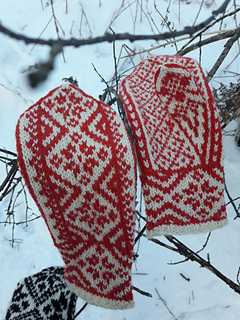 I used Selbu Husflidsgarn; 82 metres (90 yds) and 74 metres (81 yds) for the main and contrast colours, respectively. 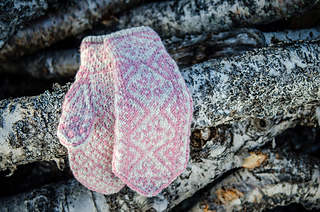 One of my test knitters used just under 105 metres (115 yds) and 84 metres (92 yds), using Rauma 3 ply Strikkegarn. The name Nea comes from the 80 kilometer long river Nea that runs from the mountains of Sweden through Selbu out into Selbusjøen (the Selbu lake). I travelled alongside this river a lot growing up. Despite being opposite from the coast line, the wide river running between high forested hills always reminded me of those classic Norwegian fjord landscapes.